Unless you happen to be French, most people would not even consider crepes as a meal option on their keto meal plan. Even fewer people would think that low carb crepes were even possible on a keto diet — but they are. This crepe recipe is extremely versatile, easy, and perfect for breakfast. Enjoy a sweet crepe with a few berries and a drizzle of coconut butter or a savory crepe filled with scrambled eggs and low carb vegetables. Your filling ingredients can be as simple or as elaborate as you like. 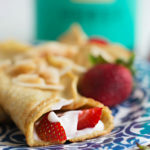 Traditional flour crepes will certainly have too many carbs that will kick you out of ketosis, but these keto crepes are low carb, gluten free and healthy because they’re made with almond flour. Almonds are a great source of monounsaturated fat. This type of healthy fat helps you maintain balanced cholesterol levels and keeps blood vessels functioning properly. Almonds also contain vitamin E and other antioxidants which are key for reducing oxidative stress in your cells. One of the best reasons to eat almonds on a keto diet is they contain a great combo of macronutrients, vitamins, and minerals. All together, these compounds give your body sustained energy. The healthy fat in nuts and nut flours also help keep you more satiated. When almonds are used for flour instead of wheat or grains, you’ll have a dose of healthy fats (56g per cup) plus minerals such as magnesium, potassium and calcium. You’ll also get 24g of protein, 12g of dietary fiber, and only 12g of net carbs per cup too. Keto friendly, nutrient dense, and fueling your body with amazing benefits — what else can you ask crepes for? Next time you want something fun for breakfast, make a big batch of these basic crepes. It may even feel like you are having dessert for breakfast.